After several years of relentless hardware and software innovation, the mainframe is at an inflection point from being a supporting platform of transaction revenue to becoming a source of revenue growth and innovation. Organizations are evolving toward what IDC calls the “connected mainframe.” The platform is transforming from a revenue-supporting machine into a revenue-generating machine and is increasingly playing a central role in organizations’ digital transformation (DX) journey. 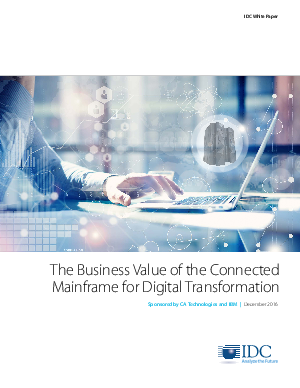 Key steps in achieving the connected mainframe require organizations to modernize and integrate the platform with their internal and external environments. IDC finds that these modernization and integration initiatives lead to new business innovations, which in turn are driving revenue growth and improving organizational operational efficiency.